Yea, here we are outside on the patio for a Springtime tea. Cissy and I made darling nests for a treat. Would you like one? The polka dot bunny tealight holder is filled with a painted rock that my son, Mike, did to resemble an Easter egg. This is my granddaughter, Cissy's, favorite cup. 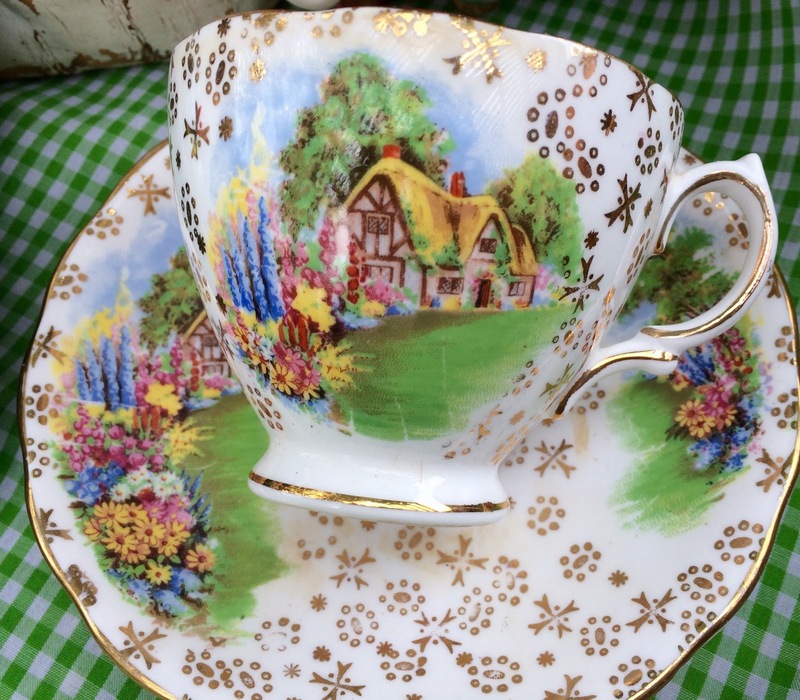 I received this from one of Stephanie's teacup exchanges from The Enchanting Rose. 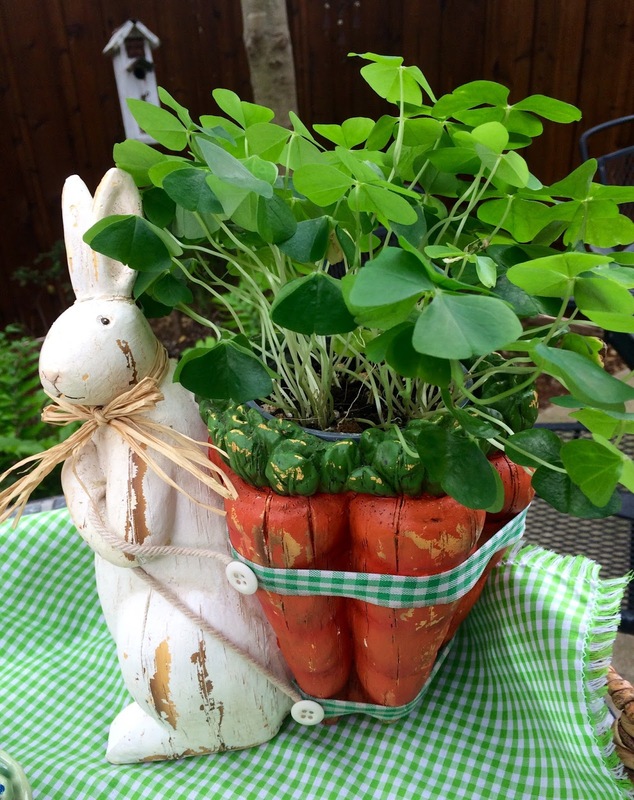 Whenever I get out this cute bunny planter, I think of my dear friend, Kathryn, who passed away several years ago. She gifted it to me, and it's a gentle reminder of her. I filled the cavity with my Shamrock plant, before I plant it outside. Doesn't Cissy look so happy with her creations? I had always made the nests with chocolate and butterscotch chips, and chow mein noodles. I saw a picture on Susan's lovely blog, Savoring Time In The Kitchen, and tried her version, and it's with pretzels. Cissy was sampling as we made them, and she REALLY liked the mixture! Cissy and I doubled the recipe and we ended up with 15. Using either butterscotch or peanut butter chips with the chocolate chips, makes for a good combo. Melt the chocolate and peanut butter chips in the microwave, and stir. Add the crushed/broken thin pretzels sticks. Add spoonfuls of the mixture to a muffin tin that has been sprayed with cooking spray. Add the Peeps and candy eggs, while the mixture is still warm, for them to adhere. When they are cold, take a knife and run it down the side of each muffin cup, and the nest easily comes out. Package the nests for gift giving! Here are the nests all packaged and ready for gifts! I don't know which is cuter, Cissy or her creations! I LOVE the bunny planter!! Have a wonderful Easter Kitty! You and Cissy make the cutest things when you get together. Your chocolate peanut butter treat is too cute! I would have liked the pretzel version better too. The next teacup swap is just around the corner...I can't wait! Those nests are so adorable, Kitty. I remember making some using broken up Triscuit cracker pieces. Love your bunny planter. What a sweet remembrance of your friend! 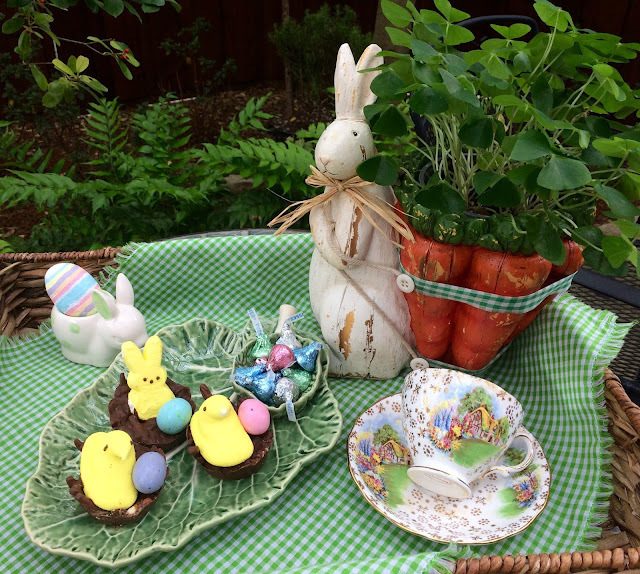 Looks like a fun springtime tea on the patio. Your bunny planter is so cute. Those treats are adorable. Well if those aren't darling!! Oh those are darling nests...I might have to give them a try this week. Yes, I would like one. =) Or three =) Cissy looks so proud...how wonderful you get to make so many 'sweet' memories with her in your kitchen. Keep up the good work Cissy! A blessed and happy Easter to you both. Cissy always looks happy! It is one of her endearing qualities...that gorgeous smile. And no wonder...she is spending quality time with you! A blessed week to you and yours! These sweet nests look delicious. I too love a good cottage teacup and treasure mine. Happy Easter sweet friend! Happy Easter!What a delicious and pretty post!I agree with Cissy,that teacup is just stunning!Best wishes!Hugs! You and Cissy (my Mom’ nickname!) make the perfect pair in the kitchen!!! Have a blessed and very happy Easter!!! Yes, Cissy does look happy with her creations! 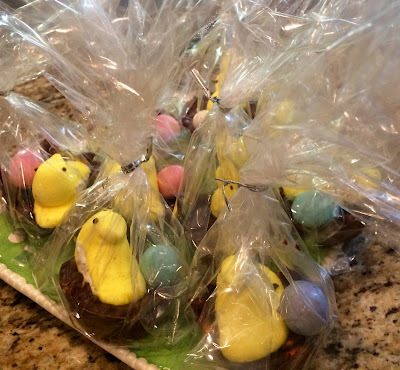 These are so cute and would make cute little Easter favors! I haven't seen them made from pretzels before! You truly are an extraordinary G'ma, Kitty. I love you two make so many wonderful yummies together. Have a blessed remainder of Holy Week, and a joyous Easter! What a darling & simple project! I love seeing what you & Cissy create. No wonder she loves that teacup...me too!! What a great treat! You have such lovely tea cups. Want to watch for the tea exchange your in, that would be so fun! What a sweet tea cup and sweeter granddaughter! Yes, Cissy ALWAYS looks happy when she's baking with you, Kitty! Those nests sound good, either recipe variation. I used to eat rice noodles out of the can like a snack chip. Your mention has me craving them again! Happy Easter, my friend. I hope you feel the joy of the season. I am in love with that tea cup too! So enchanting. Cissy's smile makes it the best! Anything chocolate - especially the smell of chocolate reminds me of being a little girl and getting my Easter basket! That smell makes me smile too! These are adorable (not to mention totally yummy looking!) That cup and saucer is beautiful - I love ones that have gold accents. The planter is SO cute - what a lovely reminder of your dear friend! Dear Kitty: Please congratulate Cissy on what an amazing Pastry Chef she is becoming! I see her in a fine hotel tea room one day serving royalty! Thanks for sharing and linking and Happy Easter Kitty! How cute. How delicious. I bet the combination of sweet and salty was a hit. Kitty, I think you and Cissy have the most fun! She is a lucky little girl to have you in her life. I love seeing her sweet smile. Thanks for sharing and Happy Easter! 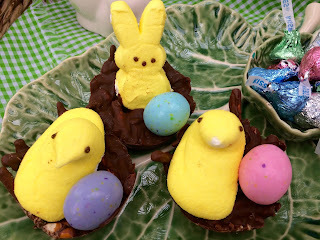 These chocolate and peanut butter nests are adorable! 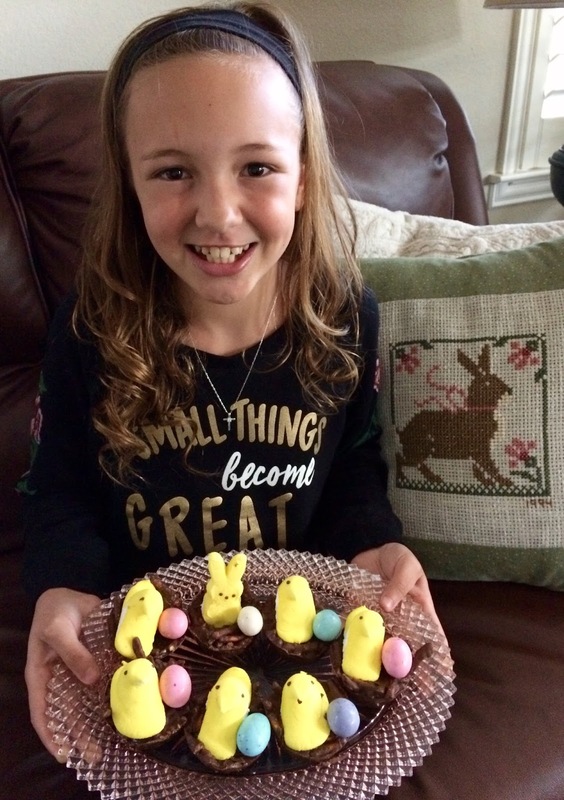 I have seen so many interesting recipes for Easter candy here on your blog that I am going to have to make some next year. I don’t really host any Easter events, so I tend not to get involved in any specialty Easter cooking or baking, but I think I need to change that. Great post! That teacup is so sweet and the nest are so fun! Thanks for sharing with SYC. I really likes your blog! You have shared the whole concept really well and very beautifully soulful read!Thanks for sharing.